Jahja Ling’s distinguished career as an internationally renowned conductor has earned him an exceptional reputation for musical integrity, intensity and expressivity. Born in Jakarta, Indonesia and now a citizen of the United States, he is the first and only conductor of Chinese descent who holds a music director position with a major orchestra in the US and has conducted all of the major symphony orchestras in North America including Boston, Chicago, Cleveland, Los Angeles, New York, Philadelphia, Pittsburgh and San Francisco. Mr. Ling is universally praised for his work as music director of San Diego Symphony Orchestra from post-bankruptcy state into one of the top tier major orchestra during his 13-year tenure from 2004 to 2017. He has appointed more than 70 new musicians from all over the world to form this remarkable ensemble, and together they have collaborated with world’s greatest soloists. In October of 2013 Mr. Ling led the orchestra in a sold-out concert for their first appearance at Carnegie Hall, followed by their first international tour to China where they appeared in five concerts in Beijing, Shanghai and Yantai. Together they have recorded works for Telarc Records and Naxos, and eight other CDs on the Orchestra’s own label. The Orchestra has named him their first Conductor Laureate in its history. Mr. Ling holds a special relationship with one of the world’s greatest orchestras, The Cleveland Orchestra, beginning in 1984 and continuing for 34 seasons, having conducted more than 550 concerts over 600 works. He has held the positions of Associate Conductor (1984-85), Resident Conductor (1985-2002), Blossom Festival Director (2000-05) and as regular guest conductor in every season since 2005, making him the conductor who has conducted the ensemble for the longest time in its 100-year history. He has also led the Orchestra for millions of audience members in its annual downtown concerts as well as the most number of concerts in the Blossom Festival’s history. His telecast of A Concert in Tribute and Remembrance with the Orchestra for 9/11/2011 received a local Emmy® Award. The U.S. House of Representatives presented a Congressional Record of his outstanding achievements in the U.S. Capitol in September 2006. Mr. Ling also served as Music Director of The Florida Orchestra (1988-2003), Artistic Director of the Taiwan Philharmonic/NSO (1998-2001) and Assistant and Associate Conductor of the San Francisco Symphony. Deeply committed to education, Mr. Ling served as founding Music Director of the Cleveland Orchestra Youth Orchestra (1986-1993), the San Francisco Symphony Youth Orchestra (1981-84), and he served as the Director of Tanglewood/BU Young Artists Orchestra during 1983 and 1984 seasons. In the last two seasons he was named Distinguished Principal Guest Faculty of the Cleveland Institute of Music. Mr. Ling made his European debut with the Leipzig Gewandhaus Orchestra in 1988 on the invitation of Kurt Masur, who was his closest mentor throughout his musical life. He has also appeared with Berlin Radio Symphony, Chamber Orchestra of Lausanne, China Philharmonic, Copenhagen Philharmonic, Guangzhou Symphony, Hangzhou Symphony, Hong Kong Philharmonic, Jakarta Symphony, MDR Symphony in Leipzig, National Symphony of Taiwan, NDR Symphony Orchestra in Hamburg, Netherlands Radio Philharmonic, Orchestre National du Capitole de Toulouse, Royal Philharmonic of London, Scottish Chamber Orchestra, Shanghai Symphony, Singapore Symphony, Stockholm Philharmonic, Sydney Symphony, and Yomiuri Symphony Orchestra in Tokyo among others. 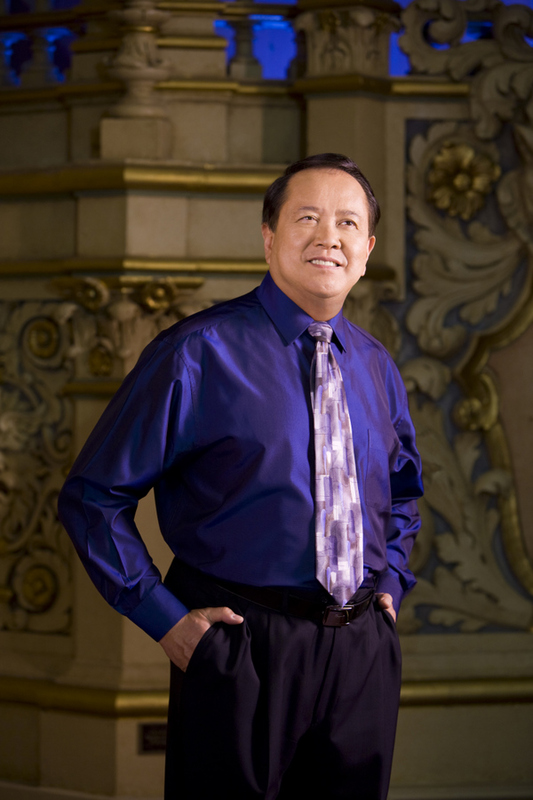 As music director of the Florida Orchestra, Mr. Ling was the first classical music conductor ever invited to conduct at a Super Bowl where he conducted Whitney Houston in the legendary national anthem at Super Bowl XXV. It was televised to 750 million viewers worldwide and their recording went platinum. It is still acknowledged as the best rendition of the US National Anthem to date. In 1983 Mayor/Senator Dianne Feinstein invited Jahja Ling to conduct a special concert in Davies Hall, San Francisco for a state visit of England’s Queen Elizabeth II. As part of the celebrations marking the return of Hong Kong to China, Mr. Ling led the Scottish Chamber Orchestra in Hong Kong in May 1997. In May 2000 his gala performance with the St. Louis Symphony and cellist Yo-Yo Ma was featured on the ABC News program 20/20. In 2001 Mr. Ling was invited to conduct the Super World Orchestra, an orchestra comprised of principals of 30 of the most prominent orchestras in Europe, America and Asia for performances in Osaka and Tokyo. In 2009 he conducted the Worldwide Chinese Festival Orchestra in the new National Center for the Performing Arts in Beijing, an orchestra comprised of the best Chinese musicians who hold major positions with the world’s most prestigious orchestras. His performance was telecast by Chinese Central Television (CCTV) and was made available for video streaming on their website. Chinese Central Television (CCTV) and Phoenix Television in China also telecast an hour-long profile of his musical journey worldwide. In June of 2012 he conducted the Schleswig Holstein Festival Orchestra in Berlin’s O2 World on the occasion of Lang Lang’s 30th birthday concert with Lang Lang, Herbie Hancock and 50 young pianists from around the world. The concert, attended by more than 10,000 people, was also telecast live by German and Spanish TV. Mr. Ling is acclaimed not only for his interpretation of the standard repertoire, but also for the breadth of contemporary music included in his programs. Among the world premieres he has conducted are works by William Bolcom, Paul Chihara, Gordon Chin, Daniel Kellogg, George Perle, Bright Sheng, Alvin Singleton, Augusta Read Thomas, Michael Torke, Mark Anthony Turnage and Ellen Taaffe Zwilich, with orchestras including The Cleveland Orchestra, Detroit Symphony, The Florida Orchestra, New York Philharmonic and San Diego Symphony. Mr. Ling’s recordings for Telarc include the Dupré Organ Symphony and the Rheinberger Organ Concerto with soloist Michael Murray and the Royal Philharmonic Orchestra, and two albums of baroque works with the Scottish Chamber Orchestra (the first of which, with trumpeter Rolf Smedvig, was nominated for a Grammy® Award). In 1998 Azica Records released a disc with Mr. Ling and the Florida Orchestra entitled Symphonic Dances, featuring Bernstein’s Symphonic Dances from West Side Story, Strauss’s Rosenkavalier Suite and Ravel’s Suite No. 2 from Daphnis and Chloé. Mr. Ling and The Florida Orchestra have also recorded Stephen Montague’s From the White Edge of Phrygia for Continuum. His performance with the New York Philharmonic of the world premiere of Ellen Taaffe Zwilich’s Third Symphony is featured in a recent compact disc collection of Philharmonic performances entitled American Celebrations. Recent releases with The Cleveland Orchestra include a special edition CD featuring Mr. Ling and the orchestra performing Saint-Saëns’ Organ Symphony for the rededication of Severance Hall’s Norton Memorial Organ. Mr. Ling was born in Jakarta, Indonesia and began playing piano at the age of four under the tutelage of Suzy Djoeandy and Rudy Laban. In 1970 he was awarded John D Rockefeller 3rd Fund Grant to study at Juilliard under Mieczyslaw Munz and conducting under John Nelson. Mr. Ling continued his orchestra conducting study under Otto-Werner Mueller at Yale School of Music, and was awarded Leonard Bernstein Conducting Fellow at Tanglewood Music Center and the Los Angeles Philharmonic Institute where Mr. Bernstein became his most influential mentor. He earned a bachelor’s and master’s degree from The Juilliard School and a Doctor of Musical Arts from the Yale School of Music where he recently received the Ian Minnenberg Distinguished Alumni Service Award in May of 2015. He was awarded an honorary doctorate by Wooster College in 1993. Mr. Ling recently received the Bravo Classical Music Icon Lifetime Achievement Award from San Diego County for his extraordinary contribution to enriching cultural life of San Diego. He makes his home in San Diego with his wife, Jessie, and their young daughters Priscilla and Stephanie. As a pianist Mr. Ling won a bronze medal at the 1977 Arthur Rubinstein International Piano Master Competition in Israel and was awarded a certificate of honor at the following year’s Tchaikovsky International Piano Competition in Moscow. He made his Cleveland Orchestra debut as a pianist in 1987 and has appeared as both soloist and conductor with a number of orchestras in the United States and internationally.